I really wanted to cycle again in Pittsburgh, and taking the airplane was too complicated. On a Wednesday, I drove the Honda 400 miles up to Morgantown, West Virginia. 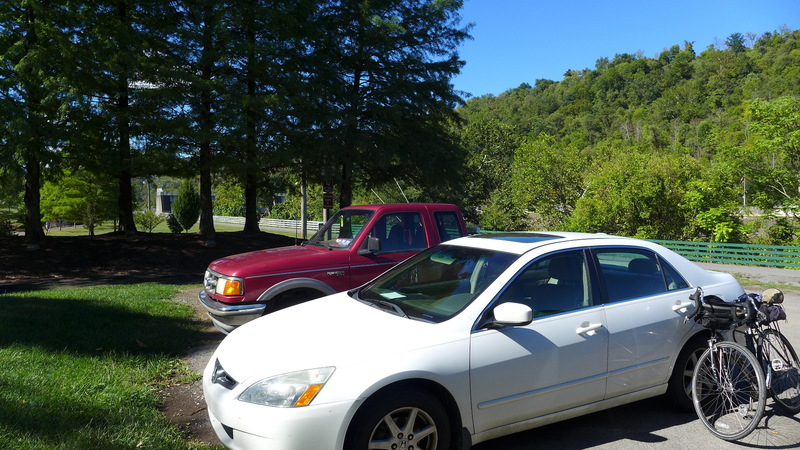 At just before four in the afternoon, I parked next to the Caperton Trail along the Monongahela River, pulled the Surley Long Haul Trucker out of the trunk, put the wheels on, and rode off north. I have had a book staring at me for ten years called “Three Rivers on Two Wheels”. I had gotten it on a previous two day bike trip in Pittsburgh with Tom Constantine. I have always wanted to go back and do more of the book’s guided tours; several twenty plus mile bike rides mapped completely in the city of Pittsburgh. Morgantown, about ten miles from the Pennsylvania border, is the home of West Virginia University. It is eighty or ninety miles south of Pittsburgh. 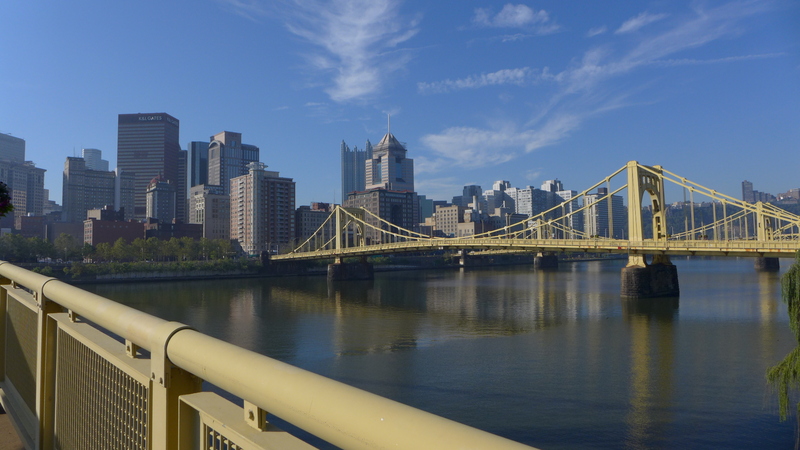 This trip was to be two days in each direction bicycling from Morgantown to Pittsburgh, plus one day in the middle to bicycle around Pittsburgh. 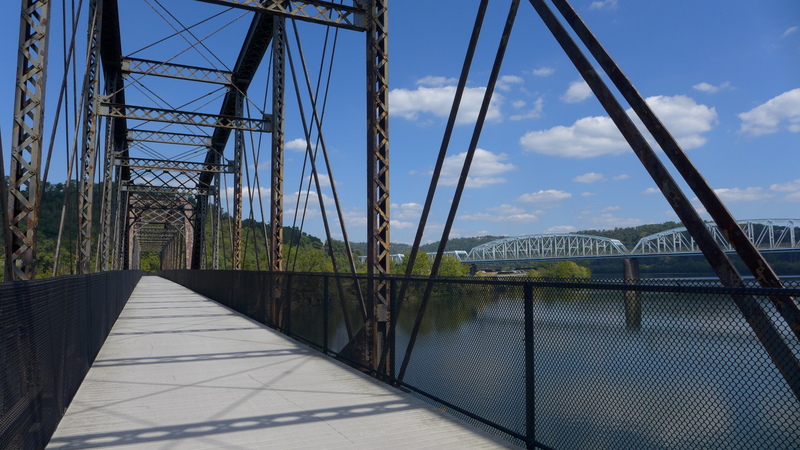 The Caperton Trail follows the Monongahela River north from Morgantown as it cuts an almost gorge between steep mountains on both sides. 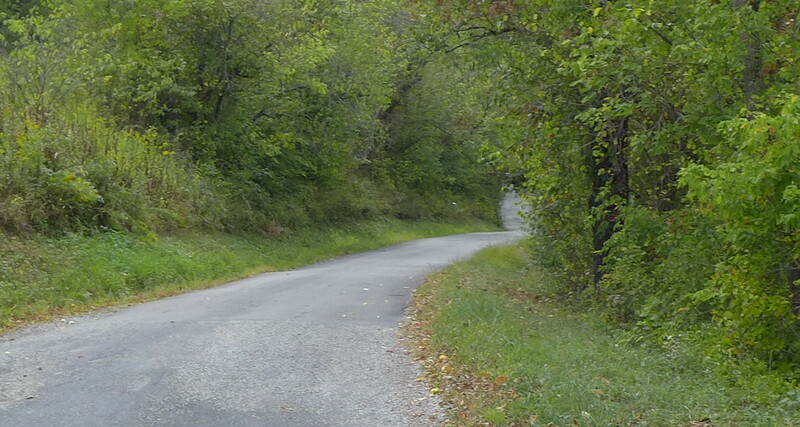 For at least the fifteen mile length of the trail, a bicyclist can avoid going up any hills. 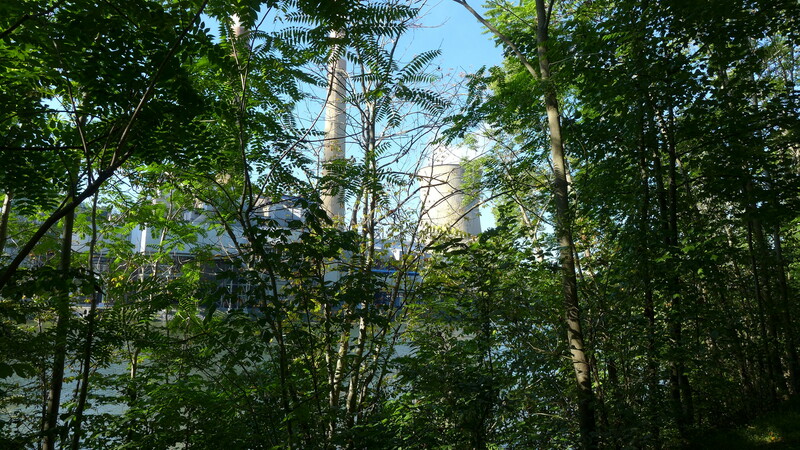 On the way north the river and the bike path go right by a nuclear power plant! 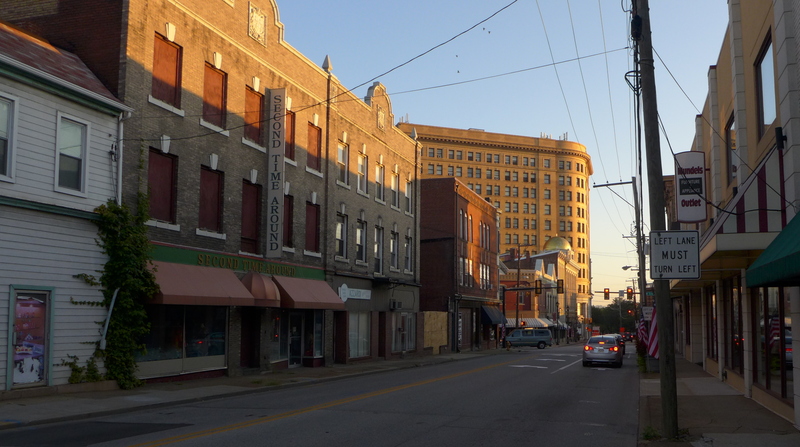 Morgantown appears prosperous, but once you get outside of town and into southwestern Pennsylvania, the towns and landscape fade into a scene out of the movie The Deer Hunter; depressed former factory towns. 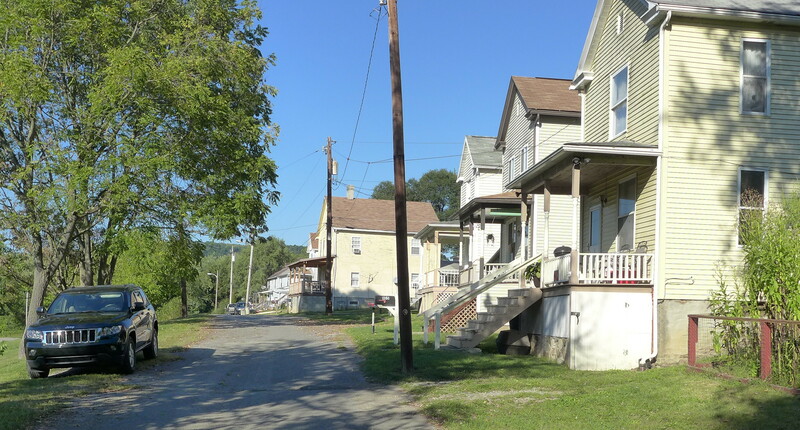 A the small town of Point Marion, PA, I left the bike trail and turned uphill. A town park had a well preserved modernist picnic shelter. 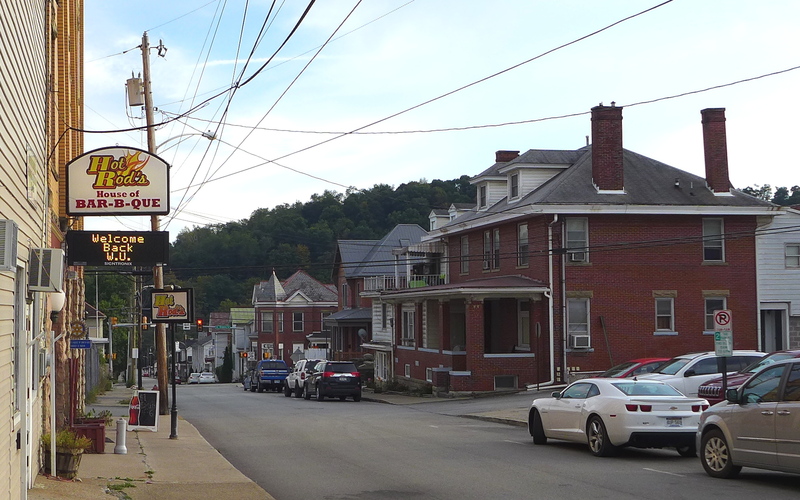 About twenty miles further down the road, I stayed the night in Uniontown PA, a small city that has seen better days. Wikipedia shows its population has fallen from about twenty-one thousand in 1940 to ten thousand today. I got a room at a little motel very close to downtown, where I could walk to a restaurant. Breakfast the next morning was at Sam’s. 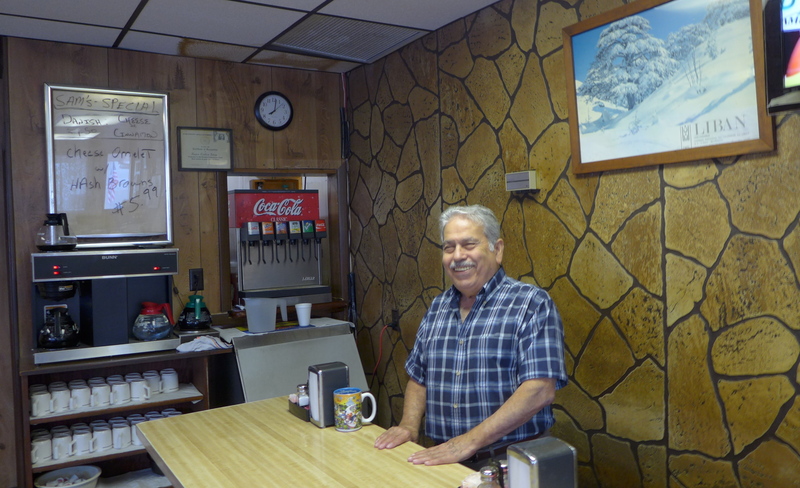 Sam has run this place for about forty years. A Lebanese immigrant, he was justly proud of the five sons he has raised in Uniontown, all now college graduates. He said he continues to run the place because his expenses are low; he owns the building, which he says is almost impossible to sell. His wife does the cooking. I was the only customer, although some guys did come in as I was leaving. After my fill of sausage and eggs, I rode off into the morning. 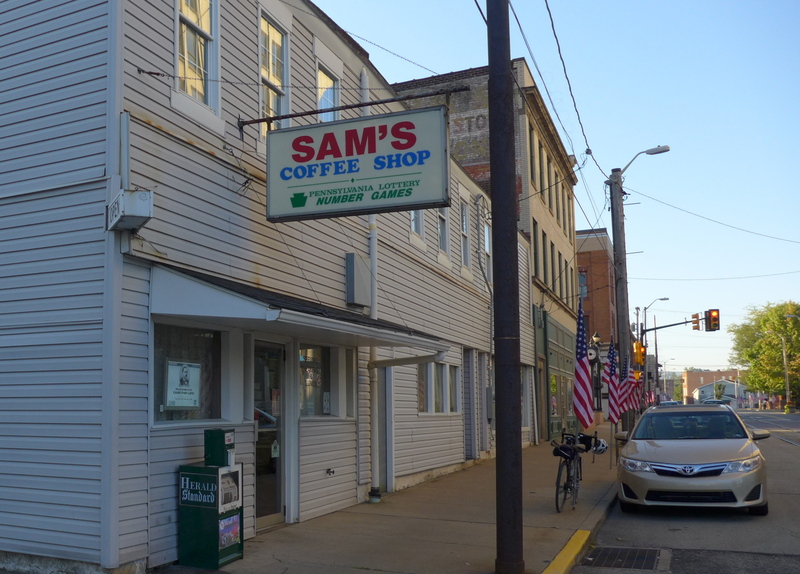 About fifteen miles down the highway, just before I got on a bike trail for the remaining forty something miles to Pittsburgh, I passed through the town of Perryopolis. While this sign spoke of Italian heritage, many people from this town and region are also Croatian. The trail is part of the Great Allegheny Passage, a recently completed bike trail that goes all the way from Washington DC to Pittsburgh. 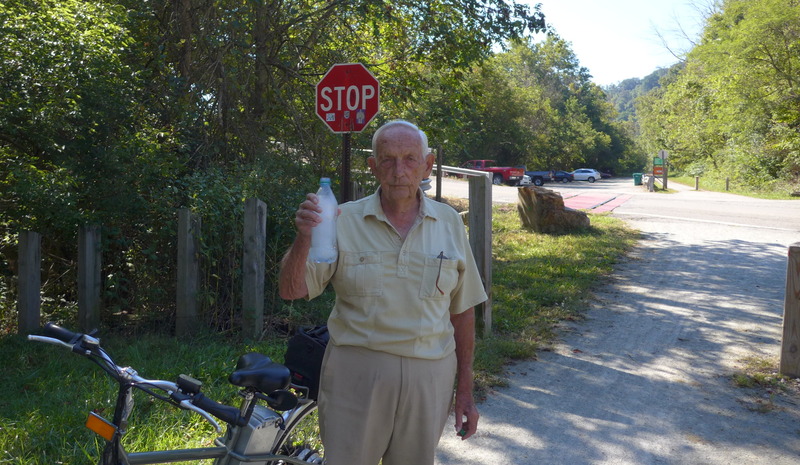 I met this guy on the trail who he said he was ninety years old. He was riding his bicycle to the driving range to hit some balls. Closer to Pittsburgh, the bike path passed by miles of industrial debris, then crossed the river on a former railroad bridge. In Homestead PA, on the outskirts of Pittsburgh, I stopped for lunch at a TGI Fridays that sat right next to the bike trail. This restaurant and the surrounding Costco, Target, and other chain stores were uneventful except for what previously stood on this site. Homestead Steel Works had employed up to fifteen thousand people before it closed in 1986. 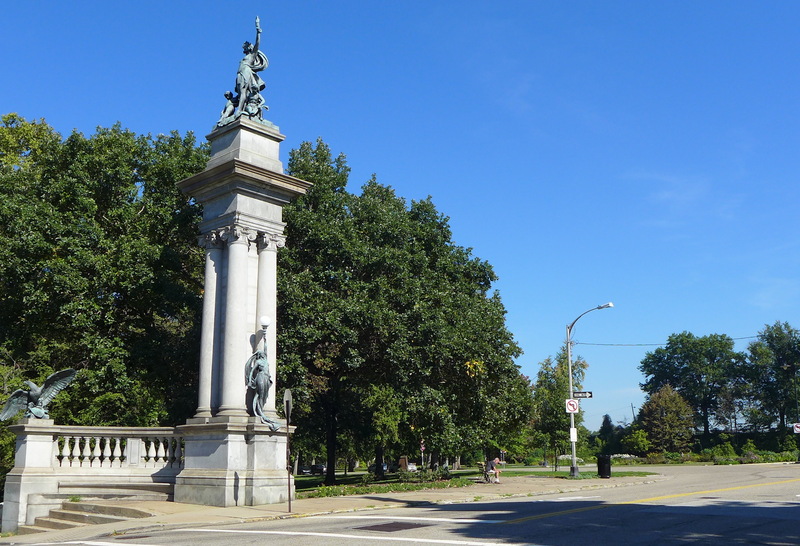 It was the site of a famous 1892 strike that left twelve people dead, a pitched battle between strikers and hired security thugs that broke the union. 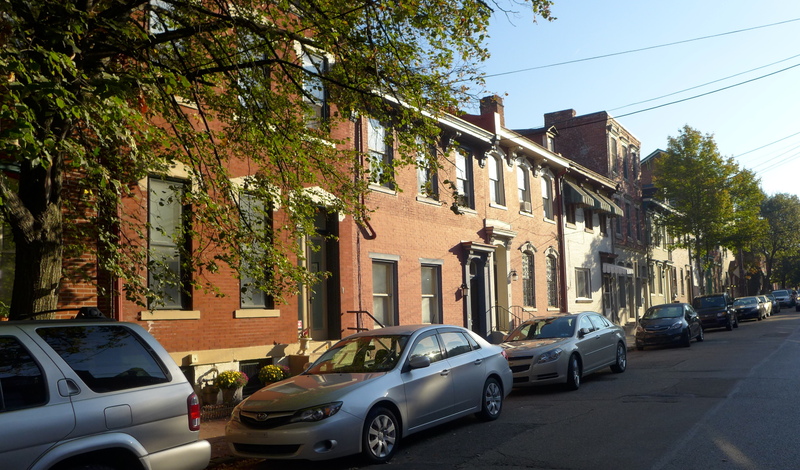 Arriving in Pittsburgh, I had booked an Airbnb for two nights in a pretty much gentrified neighborhood called Mexican War Streets; street names like Buena Vista, Monterey, and Palo Alto. 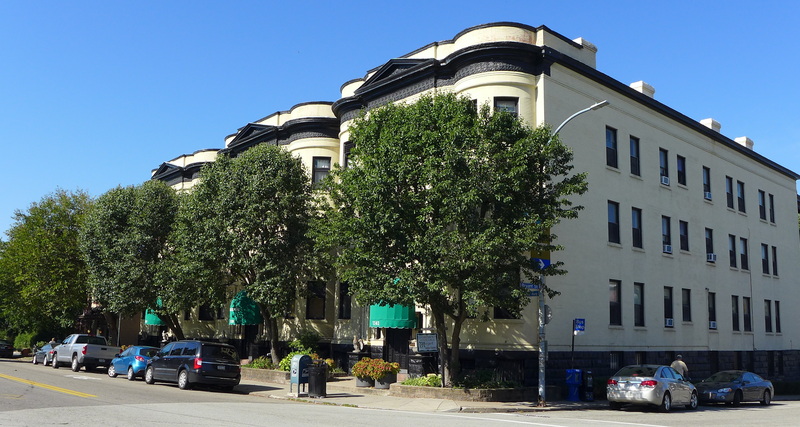 It is mostly nineteenth century row houses, across the river from downtown. 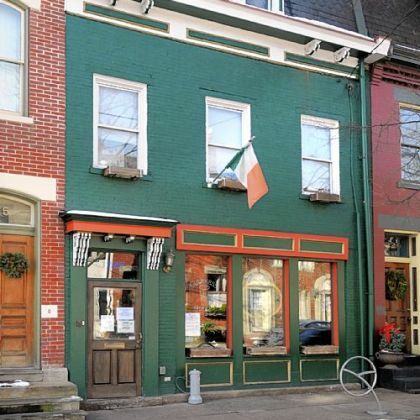 I had an informal dinner sitting at the bar of Monterey Pub, a friendly and lively Irish pub that had been transformed from one of the houses in the neighborhood. After coffee the next morning, I took a long bicycling loop through much of the east side of Pittsburgh, with directions from my guidebook. I first crossed one river into downtown, and then across the other river to the Strip District. Downtown looked impressive from the distance. The author was merciless in directing the rider up insanely steep hills. He also had something of a social conscience, and wanted the bicycle rider to tour black neighborhoods as well as wealthier white ones. A couple stretches looked practically abandoned. However, in most of the city Pittsburgh seems to have done a pretty good job in coping with its population loss and plant closings. 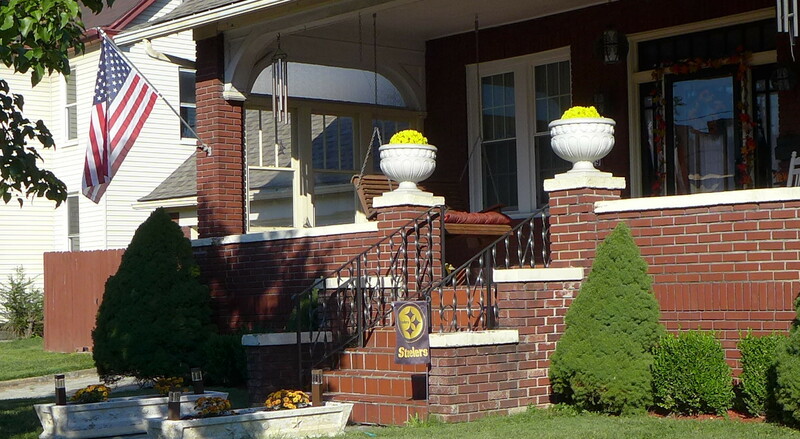 There are miles of pleasant and inviting older neighborhoods. I was reminded of what city parks are supposed to entail. Once they were thought of as grand spaces, with a grand entrance. Somehow I cannot envision Chapel Hill thinking large, and having a park with this type of entrance. That evening at the suggestion of my friend Whit, I visited an expansive modern art museum called The Mattress Factory. It was in the same neighborhood as my Airbnb, just a couple blocks away. It was having a Friday night opening. Back in the early seventies, Whit had helped with the start of the museum, and knew the famous founder Barbara Luderowski. She was happy to greet me and remember Whit, although she had not seen him since 1974! 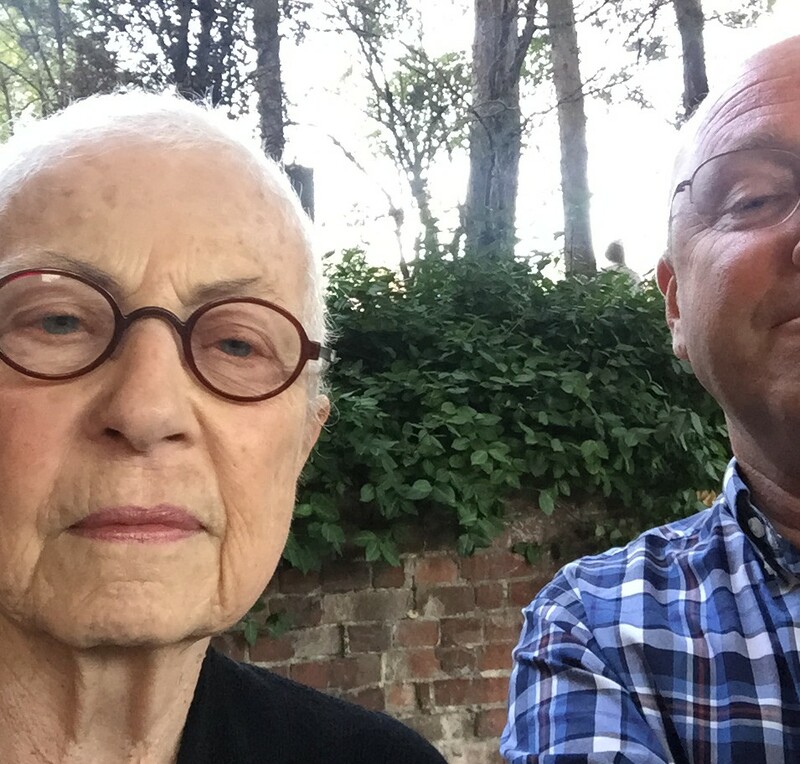 I took a selfie with her. Afterwards, I drifted over to the small restaurant Lola Bistro in a barren industrial area, still within walking distance. It was peculiarly Pennsylvanian in that it was a relatively expensive restaurant that did not have a liquor license. You brought your own wine. It was run by a married couple who were its only employees that night, the Russian born wife who ran the front and the Ohio born husband who did the cooking. There was a memorable Caesar salad. Saturday morning I started my two day journey back to Morgantown. The first section would be a route taken from the Pittsburgh bicycle guide. Predictably, after crossing two rivers and riding through the flat gentrifying warehouse area the Strip District, the road headed pretty much straight uphill. 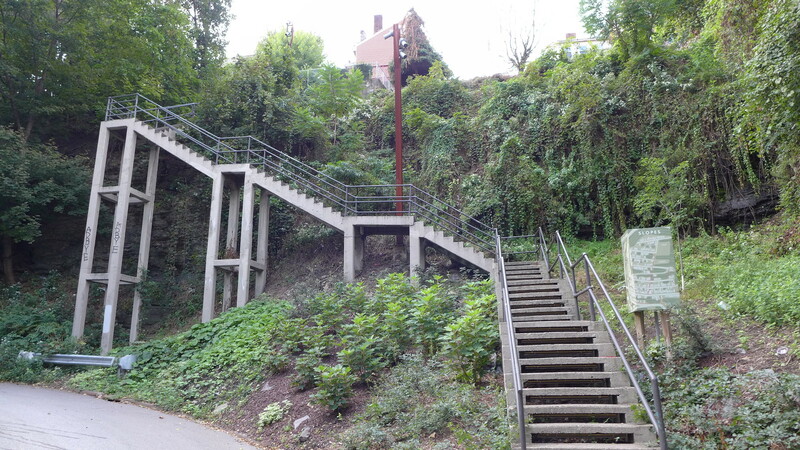 The city had many years ago built ways of getting up these hills, including sidewalks that turned into stairs and an 1876 incline railway, the Duquesne Incline. The bike ride up this hill was challenging. After about a mile, at what looked like the top, the terrain seemed to flatten out a little, but then continued more gradually going up, continuing up almost all the way to the suburb of Bethel Park, ten miles from downtown. As you traveled further from downtown, houses started to be slightly farther apart. Over twenty miles from downtown, despite of, or perhaps because of Pittsburgh’s population loss, suburbs were still expanding. 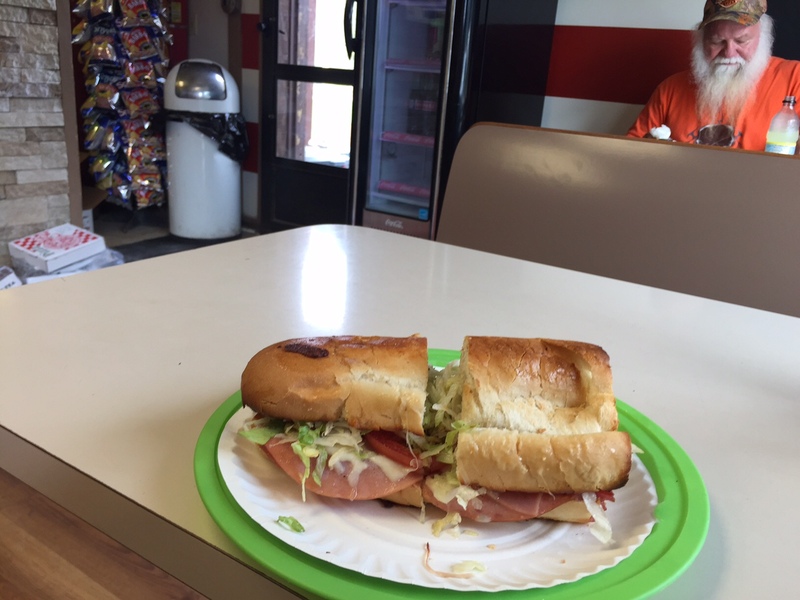 Still further out, finally in countryside and no longer in a suburb, I stopped for lunch at Danny Jr’s Pizza & Hoagies, on a strip of road called Eighty-Four, Pennsylvania. The sandwich was delicious. The other customer was very friendly, a guy with a Santa Claus beard dressed in Harley-Davidson colors. Scattered about were magazines and newspapers about guns. While I have seen none at any houses while bicycling recently in North Carolina, this was the first of two Confederate flags I saw on houses in southwestern Pennsylvania. I was a tiring and exhilarating day. Google Maps For Bicycle routed me on long stretches of quiet country roads, roads that lurched brutally up and down steep grades. I limped into Waynesburg PA at about four in the afternoon. This town looked depressed, even by the standards of other towns and cities that I had seen. It apparently is the center of both the coal mining and oil drilling industries. Pickup trucks are popular here. Count the number in this random photo, taken in front of a dead Walgreen’s in Waynesburg. Much of the older part of town looked kind of worn. There were no hotels downtown. The chain motel out by the freeway was quite nice, but I had to bicycle a couple miles in to the one decent looking restaurant downtown, unless I wanted to eat at the Bob Evans near the motel. 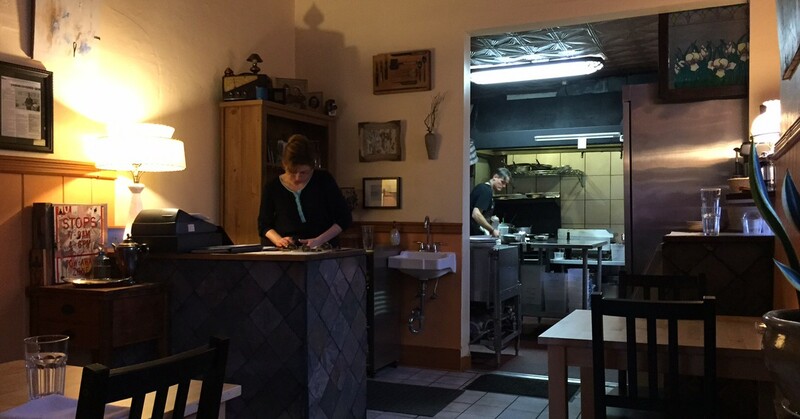 Reviewers on Yelp spoke highly of Hot Rod’s, and I really enjoyed eating there. They had several kinds of barbecue; I got the beef brisket. 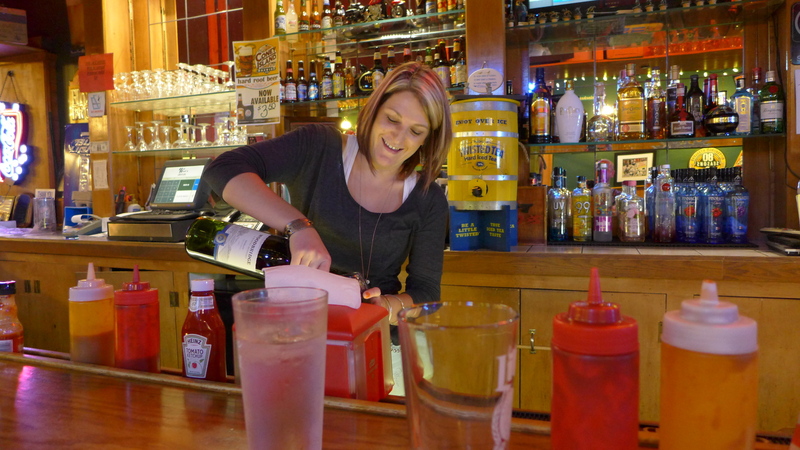 It was fun to watch the bartender work. There were rough looking guys in there trying to kid her around, and she seemed to handle them with an easy professionalism. The next morning, a Sunday, the ride along the U.S. Highway 19 had little traffic, and passed through pleasant countryside. I was a a little less than thirty miles to my car in Morgantown. In the tiny town of Mt. 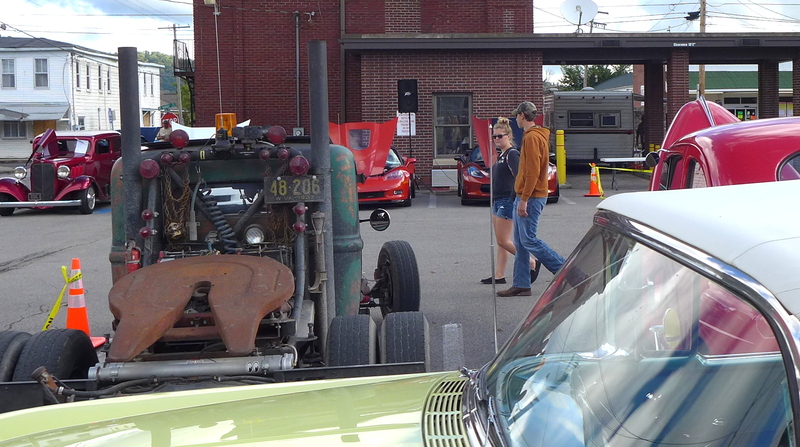 Morris, PA, just a couple miles from the West Virginia line, there was a Sunday morning car show going on. Morgantown looked surprisingly shiny, and more like Chapel Hill than places I had been. As soon as I crossed the West Virginia line, I saw several groups of cyclists riding fancy road bikes with stretchy outfits. I was mildly worried that my car might not still be there at this trail parking lot, but there it was. You show so many interesting parts of our country without judgement–you fit in wherever you go. Thanks for sharing your travels.